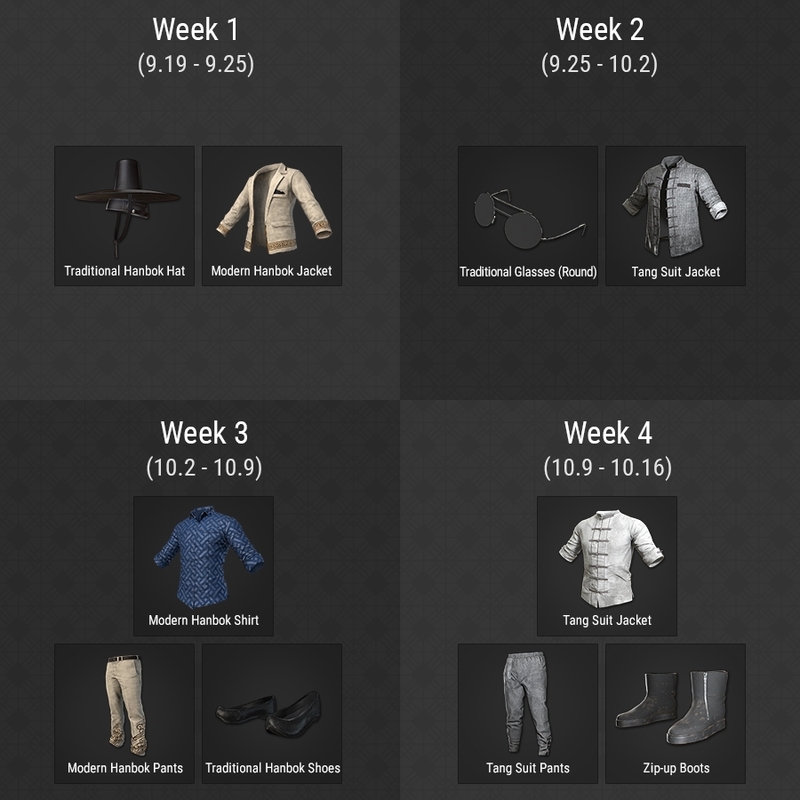 Our PUBG Mid Autumn Festival Guide explains how to unlock the Hanbok and Tang skins, and contains the start and end dates for the new event. 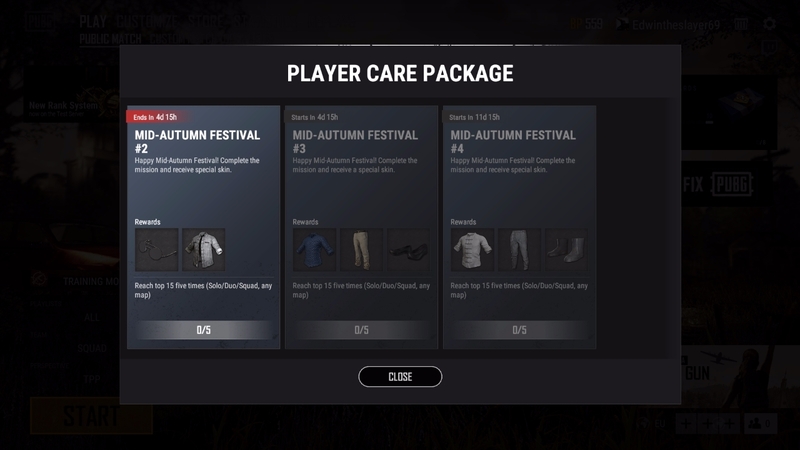 A new in-game event is coming to PUBG, and it goes by the name of the Mid-Autumn Festival. For as long as the special event is active, you'll be able to work towards unlocking a collection of festival-specific cosmetic items, released over a period of several weeks. In this article, we've pulled together all of the official information that's been released about the event into one place. You'll find a timetable of the content updates, items available each week, and a snapshot of all the skins right here in one place. UPDATE - We've just dropped the Week 2 rewards and event requirements into the top of this guide so you know what to expect! To receive all three of these reward sets, you simply need to finish in the top 15 a total of five times this week. You can achieve these positions in Solo, Duo or Squad play, and on any map. You have until 5:59pm (PT) on Tuesday 2nd October 2018 to complete these requirements and claim your rewards before they're gone for good. The event will run from September 19th to October 16th. Each of the four weeks will introduce a new set of items to unlock. First of all though, here's the timetable for what's unlocking and when. Note that each week's activities kick off at 6:00pm PDT, and finish at 5:59pm PDT on the final day. At the time of publishing the first edition of this article, the devs have not explicitly explained how these items unlock. We'll update our guide as soon as we have more official information. What we do know right now is the there will be certain "requirements" that you'll need to meet in order to unlock the rewards from each weekly event. When each week's update goes live, you'll be able to click a create icon in the game lobby to see the full details of the event, as well as the associated rewards. Note also that you'll need to claim your rewards by clicking the "Receive" button before the end of each weekly period. If you fail to do so, you'll miss out on picking up the items you've worked on unlocking. As the game is updated each week, we'll pop a note in here outlining the current requirements for the new skins that have just entered the rotation.